Kenya Beaches: What's There To See And Do? Kenya’s great reputation for safaris could make us almost forget that the Kenya beaches are highly popular as well. Kenya has 500 kilometers of soft white sand beaches, with palm trees, the bluest water, ever shining sun and some very good quality beach resorts in all price categories. While the beach area draws a lot of tourists, it’s still much less developed than the big European or North American beach spots – in the positive sense of the word. Most visitors to the Kenya coast arrive in Mombasa. The beach areas can be category put as either north of Mombasa or south of Mombasa, with the latter being the busiest. If you like a lot of company, they’re good, but there are enough beaches left were you’ll be basically alone. Diani beach, located in south of Mombasa it is the most popular and beautiful beach in Kenya. It is famous for its coral reefs, underwater sunbaths and widespread palm vegetation. You will find it is a great place for both swimming and surfing. You cannot forget the fact that Diani has some of the best accommodation in Kenya, from budget tree houses to funky lodges and intimate honeymoon spots. Tiwi beach, located on south coast is more secluded compared to Diani beach; here you will be treated to lovely, quiet, cottage style escape by the ocean, studded with skinny palms and beautiful coral reefs. On the northern side, Nyali beach takes the crown of the most popular beach. It is endorsed with nice selection of places to sleep and eat, and the sand is not far away. You should not forget the Lamubeaches; it is mainly composed of white sandy beaches, a perfect place for relaxation during a vacation. Manda Bay and the Shela beach are the most popular, surroundedby luxury resorts built around the ocean and picturesque views. Here’s a review of the most popular beaches in Kenya to help you make the best choice. PACKAGE DEALS: Whenever I’m in the mood to sit back and go with an organized trip, Africa Guide is where I’ll look first. They are the leading organized tour and package trip specialist in Kenya. As dedicated Africa specialists, their trips are a lot more interesting and special than those of the large Western travel agencies. Currently, they offer over 160 holiday packages. DO-IT-YOURSELF: If I’m in an independent or picky mood, and I want to put my own trip together, I’ll use Africa Point in Nairobi. They offer the largest collection of quality Kenya beach hotels I’ve ever seen in one place, and are the only travel agent offering domestic flights from most quality air companies in Kenya. They have a reputation for patient, one-on-one help with putting together personalized trips. 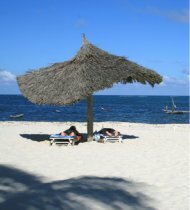 If you’re looking to book a beach hotel, have a look at my reviews of beach resorts in Kenya. A big attraction are the coral reefs just outside the Kenyan coast. They are rated by top divers as being in the top three of most beautiful coral reefs in the world, along with the Red Sea and Australia’s Barrier Reef. They make fantastic spots for scuba diving. Besides diving, it’s possible to do other water sports, among them water-skiing, snorkeling, rafting and fishing. Especially at the busier beaches, rental equipment and guides are widely available. Read the whole story on my separate page about all the water sports and things to do on the beaches of Kenya. The coast area is also famous for the Swahili culture – the mix of Arab, African and other cultures that have been mingling there for ages. For over 1000 years, the coast has been frequented and dominated by Arab traders and colonizers, and as a result many inhabitants were converted to Islam. You can see the history essentially a tale of trade and conquest with outside forces. The mixture of Arabs, local Africans and Persians traders gave birth to the Swahili culture and the language itself. Since the 16th century, the Portuguese and later the British colonized the area. The results can still be seen in several well-maintained Old Towns and ruins, which are wonderful to visit. One of the most important and controversial topics in relation to the history of the coast, silently dealt with, is the slave trade of the Swahili coast also refered to the East-African slave trade between the 7th and 19th centuries. The trade both predated and exceeded the Atlantic- triangular trade. Currently this dark chapter of African history is seldom discussed by Kenyans. Read about interesting things to see on my page about The Kenya Coast Area: The Other Highlights.